If you’re looking for Fort Worth storage auctions, you’ve come to the right place. 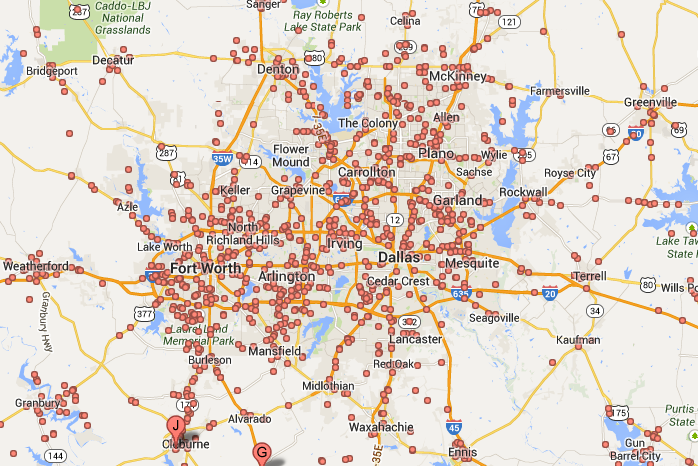 On average, we list more than 300 auctions every month for the DFW area. Our weekly schedule includes auctions held at every storage facility within 50 miles of Dallas, including Ft. Worth. Click on the image below for a map of our coverage area. By using our service, you have easy access to auction listings, even those that aren’t widely advertised or well-known. Many of our listings cannot be found on any other auction listing website. Most auction listing sites get their information from other databases, so they list the same handful of auctions over and over. We operate differently. 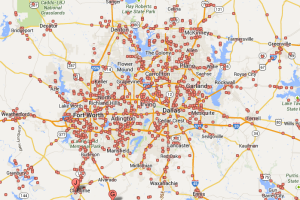 We call each and every storage facility in the DFW area to get the most current auction schedules. Altogether, we contact about 1,100 storage facilities to compile our listings. As an auction hunter, you don’t want to spend every minute scouring Ft. Worth newspapers or calling local facilities to put together a list of auctions. You want to spend your time on attending auctions, finding treasures and selling them at a profit. That’s where we come in: We do the research for you so that you don’t have to. When you subscribe, you’ll receive an easy-to-read, readily printable PDF file listing all Dallas / Fort Worth storage auctions scheduled for each week. This is an example of our storage auction schedule – These are not actual auctions. The facility above is selling a gun safe, a crossbow, 3 tool chests, a gas powered blower and welding equipment. The facility above is selling an RV. The facility above is selling a guitar, antiques and construction equipment. The facility above is selling a four wheeler, a 2005 Ford F-150 and restaurant equipment. The schedule will provide you with the name, address and phone number of each facility, the time and date of the auction and the number of units available. We’ll even let you know if there are any interesting or unusual items worth noting at the auction. Aside from the auction listings, you’ll also be granted access to our knowledgeable community through our blog and forums. These resources will get you in touch with other auction professionals throughout the country, and you can use them to ask questions, share your own expertise and network with others in the business. Subscribers will also receive our e-book, The Storage Auction Pro, absolutely free. This guide will provide you with everything you need to know to launch your own storage auction business. There are currently 50 Dallas / Ft. Worth storage facilities holding auctions this week; subscribe now for instant access to our auction lists and to receive your free e-book.